The Oregon coast is located in the Lower Columbian Biogeographic Region, that portion of the Pacific Northwest coastline that is seasonally affected by the Columbia River (Rumrill 2006). Highly complex coastlines define this region, forming important coastal habitats that support a wide diversity of terrestrial and aquatic communities. Such physical and biological diversity is a result of a wide range of interconnected historical and contemporary processes that have far-reaching effects on the ecology and economy of the region. 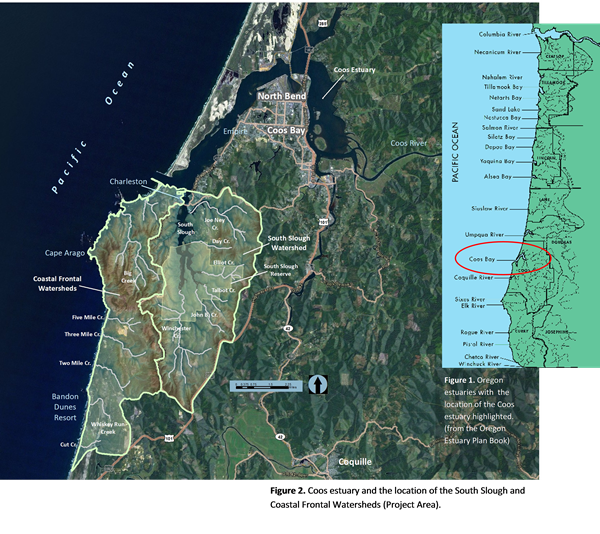 The 610 square mile Coos watershed , comprised of 75 percent private, 15 percent federal, and eight percent state held lands, is home to the Coos estuary, the largest estuary on the Oregon coast outside Columbia River estuary (Figure 1). The cities of North Bend and Coos Bay as well as the unincorporated towns of Empire and Charleston are all located on the estuary to form coastal Oregon’s largest population center (Figure 2). The Coos estuary’s main body extends north and east 15 miles from its mouth to the Coos River, and a smaller body south of Charleston forms the South Slough. Most of the Coos estuary’s shoreline is currently managed or available for residential, agricultural, industrial and commercial purposes, with periodic dredging required to support the largest port on the Oregon coast. A 5,000 acre portion of the ~20,000 acre South Slough watershed has been managed since 1974 for research and education as one of 29 National Estuarine Research Reserves (NERR) in 22 coastal states and Puerto Rico. The Pacific Ocean—from large-scale seasonal variability in atmospheric pressure over the northern Pacific Ocean to cyclical patterns in nearshore ocean currents—defines the climate of this region, characterized by moderate year-round temperatures (7oC – 15oC) and strongly seasonal precipitation (147-158 cm/yr). The influence of the Aleutian Low in the north Pacific creates southwesterly winds that bring precipitation primarily as rain during regular storm events in cool, wet winters; dissipation of the Aleutian Low during springtime and the transition to higher atmospheric pressure in the north results in coastal winds predominantly from the northwest and dry, warm summers with frequent fog near the coast. The heating of air over the land causes thermal updrafts that translate to onshore winds, or day breezes, that are typically strongest during summer afternoons. Cold, deep ocean water pulled near the surface along the coast during regular summertime upwelling events combined with warm, moist air result in foggy conditions that can persist for days at a time along the coastal belt. The moderate climate, along with a wide range of geological characteristics and physical features, has enabled a wonderful diversity of life forms to characterize the ecology of the southern Oregon coast. Rich biotic resources are found in a multitude of niches, ranging from diverse fungi on the damp forest floor to shorebirds nesting on sand dunes to elk and deer browsing marsh edges. The abundant forests provide shelter, food, and nesting sites for dozens of bird species, and the multitude of streams provide habitat for amphibians and fishes, including salmonids. Many biotic resources in this region are unique, with some estuarine and upland species assemblages existing here at the northernmost extent of their range, while others have strong affinities for species groups that exist much farther north. The resulting mixture of highly diverse fungal, algal, plant, and animal species formulate a broad ecological mosaic found only in this region. The widely varying niches have provided ample opportunity for non-indigenous species of aquatic and terrestrial plants and animals, as well; Coos Bay is the second-most-invaded inlet on the west coast of North America, and hundreds of terrestrial invasive species exist in the uplands of this region. These invasions disrupt and change the natural balance of ecological function, and further define the region’s dynamic nature. During the earth’s last ice age, which reached its maximum about 20,000 years ago, sea level was so much lower than it is today (about 120 meters lower) that the Pacific Northwest coast was located as far as 125 km west of its present location. Thus Oregon’s oldest known human settlement, near Brookings, was located about 12,000 years ago several kilometers from the current day shoreline. As today, the coast was subject to periodic geologic disruption in the form of subduction earthquakes and resulting subsidence and uplift cycles. At the end of the ice age, about six thousand years ago, sea levels rose and stabilized to approximately present-day levels which enabled the preservation of traces of human settlements on our coast that existed over the past 6,000 years. Tools and the remains of animals used for food accumulated near settlements and persisted in the absence of tidal inundation. A significant body of archaeological work exists analyzing the role that prehistoric people played in the ecology of this region. Hall et al. (2012) detail many aspects of prehistoric ecology, and their work is summarized here. Prior to European presence, people lived on the Oregon coast in small populations near estuaries and coastal lowlands where resources were abundant. Intimately familiar with the local environment upon which they depended, native communities enjoyed a diverse diet, harvesting marine resources such as clams and mussels and marine mammals as well as terrestrial creatures such as deer and elk. They actively managed some aspects of their environment, which included the use of fire to enhance browsing opportunities for game such as deer and elk, and stream and tidal channel modifications to help catch salmon, trout, lamprey and other aquatic species. These practices helped to stabilize native’s food sources which enabled modest population increases, including immigration of more northern populations to the southern Oregon coast during the last millennium. Native people appear to have achieved sustainable lifestyles on the coast resulting from the diversity of resource use and their relatively low populations. The project area has been home to several waves of Indian settlements for the past 3,000 years. Evidence suggests that the area had been thickly settled before the time of the gold rush of 1850. However, abandoned settlements were described in the journals of European explorers during the mid-1800s, implying that introduced diseases that plagued native populations across North America may have reached the Pacific Northwest in advance of permanent European settlement. Remnants of settlements are still today being found and protected in coastal areas. Beginning in the mid- to late 19th century, establishment of European settlements consisted largely of infrastructure to facilitate gold mining (during 1853-1855 at the mouth of Whiskey Run Creek in the Coastal Frontal Watersheds area) and then settlements for coal miners and a growing shipping industry to support the transfer of coal to the nearest market, San Francisco. Soon after, the timber industry overtook coal as Coos Bay’s principal export while settlers converted tidal bottomlands to facilitate a variety of agricultural activities. The local fishing fleet grew to commercialize the abundant local fisheries. Timber harvesting, fishing (both commercial and recreational) and now mineral sands mining remain significant commercial activities in the project area (see more in Land Use Activities in the South Slough and Coastal Frontal Watersheds below). Relatively new economic drivers including tourism, retiree settlement, and scientific research (Oregon Institute of Marine Biology, South Slough National Estuarine Research Reserve, Coos Watershed Association) now also take place in the project area. The Partnership for Coastal Watersheds has focused on the resources and associated challenges facing two adjacent areas within the greater Coos watershed: the west-sloping Coastal Frontal Watersheds parallel and are bounded by the ocean to the west and extend east to the Seven Devils ridge, and extends from the southern entrance of Coos Bay south to Bullards Beach; and the South Slough Watershed an estuarine basin encompassing 19,600 acres connected to the Coos estuary near its outlet with the Pacific Ocean (Figure 2). The project area comprises a total of 47,146 acres and includes 344 miles of paved and unpaved roads. Land ownership is 57 percent private, 30 percent county, 12 percent state, 1 percent municipal (Coos Bay North bend Water Board) and 0.4 percent federal. The project area is largely defined or influenced by semi-diurnal tides, with two high tides and two low tides each day. The tidal flux averages about 2 meters, with maximum recorded amplitude of 4.1 meters between the lowest low and highest high tide at the confluence of South Slough and Coos Bay. Water entering Coos Bay’s relatively narrow entrance escalate to velocities averaging 0.4 meters per second, with a maximum of nearly 1 m/s and bring saline ocean waters into the estuary, including the South Slough. The marine-derived nutrients play a strong role in structuring the marine and estuarine communities in the South Slough. Along with seasonally-varying freshwater inputs and a variety of factors influencing water quality, dynamic mixing zones in mid-estuary regions define tolerance levels for a wide range of aquatic plants, animals, and algae. The outer coast is also widely influenced by tidal flux, but many effects are physical: high tides during storm events contribute to erosion of beach faces and sand dunes, and similarly, stream outlets can be altered by shifting sands during storm events. Recent escalations in sea level, storm frequency, and storm intensity will continue to exert strong influence on these coastal areas in conjunction with regular tidal fluctuations (see Climate Change Overview). The Coastal Frontal watersheds contain six main streams that flow directly into the Pacific Ocean. The largest of these, Big Creek, drains into Sunset Bay while the other five flow in channels through the beach that are often blocked during the summer by shifting sands. The South Slough watershed is mainly fed by Winchester, Elliot, John B., Talbot, Day, and Joe Ney creeks, the largest of which is Winchester Creek. The geological landforms of this region have formed over successive waves of inundation and drying; uplifting, faulting and folding; and erosion and deposition. Rumrill (2006) provides a thorough geological history, summarized here. The oldest strata in the project area are the deep-marine Sacchi Beach beds from the Middle Eocene (48.6 – 37.2 million years before present [B.P.]). These beds were subsequently overlain by the Coaledo Formation, sediments deposited by rivers draining from the Klamath area when sea levels were shallower in the middle to late Eocene. These sedimentary rocks consist of sandstone, siltstone and mudstone with some remnants of volcanic origin (Madin et al., 1995). The Coaledo Formation is primarily exposed along the east side of the South Slough watershed, but also underlies the majority of western South Slough creeks, Five Mile Creek, and Three Mile Creek and forms the hill slopes in the Big Creek area. In the South Slough watershed, the Bastendorff Formation (Late Eocene, 40-23 million years B.P.) consists of shale deposits containing a multitude of invertebrate microfossils, and is exposed in steep hillsides along Dalton Creek. The northwestern portion of South Slough has visible sections of Tunnel Point Sandstones (40 million years B.P.) and associated mollusk fossils. The systematic progression of Coaledo, Bastendorff, and Tunnel Point sedimentary deposits indicates regular deposition without exceptional tectonic activity. The absence, however, of significant deposits from the late Eocene until the mid- to late Miocene (10 – 6 million years B.P.) implies significant tectonic upheaval in the intervening time period, and likely represents the time period during which the South Slough basin was formed. In the Coastal Frontal watersheds, the Quaternary marine terraces from the Pleistocene era (2.6 million to 12,000 years B.P.) consist of weakly consolidated sand, sandstone, and pebble conglomerates that were successively laid down, folded, and compressed as sea levels rose and declined during periods of glaciation; these compose the hills above Five Mile Creek and the Seven Devils divide as well as the terraces around Two Mile Creek, Whiskey Run Creek, and Cut Creek. During the Holocene era (12,000 years B.P. to present), valleys were filled with alluvium from these Quaternary terraces and sandy beaches migrated inland as glaciers retreated (Madin et al., 1995). It is here that black sands comprising gold, platinum, chromite, zircon, quartz and garnet are found, having been winnowed and concentrated through wind and wave action (Baldwin et al., 1975). Streams found within the study area have formed by erosion during periods of gradual uplift of the Quaternary terraces. The geological processes of faulting, folding, uplifting and eroding have resulted in a complex landform in the project area that provides a wide diversity of different aquatic and terrestrial habitats. The South Slough’s approximately 550 acres of intertidal habitat contains large expanses of eelgrass beds alongside its meandering, shallow channels, providing essential habitat for many fish and shellfish species, including Dungeness crab. There is evidence that these valuable habitats, while subject to erosion from channel movement, are expanding in overall extent. Slightly higher in the intertidal zone, quiet coves and slough-side beaches support highly diverse plant communities in marsh environments. These marshes provide habitat for a multitude of invertebrates and support a wide range of migratory and resident bird populations, browse areas for deer and elk and form the base of the estuary food chain. Second-growth Douglas-fir and Sitka spruce forests dominate the uplands, and include other conifer species such as Western red cedar and Port Orford cedar, the latter at its northernmost extent. Red alder populate the streamside lowlands in their role in primary succession, and shrubs such as willow, salmonberry, evergreen huckleberry, and others comprise the understory, providing browse for deer and elk and cover for a variety of small woodland mammals and amphibians. The South Slough estuary is influenced by several freshwater streams. Winchester Creek is the largest, and forms the head of South Slough’s main extent (Winchester Arm). Winchester Creek supports relatively small populations of coho salmon and sea-run and resident cutthroat trout. Sengstacken Arm is an offshoot to the east of this main stem where freshwater inputs are provided mainly by Elliot, Talbot, John B. and other smaller creeks. Joe Ney Creek forms the northernmost arm of South Slough. These freshwater streams provide substantial inputs during the rainy winter season, creating strong temperature and salinity gradients in the estuary with cold, highly dilute waters in the upper reaches and warmer, saline waters near the estuary’s mouth. Conversely, during the dry season, low stream flows result in a much-reduced freshwater lens at the head of the estuary. As a result, estuarine organisms inhabiting the aquatic realm must be highly adaptable to seasonal swings in these and other parameters. A detailed profile of the ecology of the South Slough watershed is available (see Rumrill 2006). As in the South Slough watershed, hillsides in the Coastal Frontal watersheds drop steeply from the Seven Devils ridgeline and are covered primarily in Douglas fir forest with Sitka Spruce and cedar (both Western Red and Port Orford) in more protected areas. Slopes are gentler to flat in the Quaternary terraces, mostly covered with second-growth forest and transitioning to shore pine closer to the ocean. The westward-running streams in these terraces have eroded into narrow valleys as the surfaces have uplifted. Aquatic habitats in these perennial streams include pools and riffles, although sand and silt dominate most substrates and, in logged areas, cover is often limited to overhanging shrubs. Most of the shoreline, particularly where dominated by Quaternary sands, is shrub land with shore pine; however, in disturbed portions of the southern extent of the Coastal Frontal zone, gorse dominates wide expanses of the coastal zone. The shifting sands extend into the surf zone, which is newly recognized as providing rearing habitat for Chinook salmon (Marin, Jarrin et al., 2009). The nearshore region of this coast provides a wide diversity of highly productive habitat types, from rocky sub-tidal and intertidal areas that support encrusting invertebrates and rockfish assemblages, to expansive sand- and mudflats that harbor a myriad of burrowing species assemblages. Large-scale industrial forestry has long been the primary driver of the economy in the Pacific Northwest and in the Coos Bay region, with both privately owned and county-managed timber stands supporting domestic lumber production. Focused logging in South Slough watershed began in the 1850s and continues today at a smaller scale, particularly in the Coos County Forest. Within the Reserve, most second-growth trees were harvested by the 1950s, and forest stands today span a variety of seral stages, the majority of trees in the age range of 30-80 years. The Oregon International Port of Coos Bay is the Oregon’s coast’s largest deep-draft harbor. Wood chips are the largest export, destined for production of paper, processed wood products, and mulch. Exports of logs harvested from public lands are prohibited, but the export of privately owned timber to Asian countries is a significant industry, especially recently: 2011 exports were higher than any year since 1996, with log export volume doubling that of 2010. While the majority of lands in the South Slough and Coastal Frontal watersheds have been used for commercial timber production, mining activities have occupied a comparatively small area in the project area. European settlement in the Coastal Frontal basin began with a gold rush to work the black sands at the mouth of Whiskey Run Creek. While this original rush died out after two years, the black sands were sporadically mined in the early 1900s for gold and platinum, during World War II for chromite concentrates, and since 2010 for mineral sands including chromite, garnet and agates. Non-extractive activities are playing an increasing role in the project area. While the Sunset Bay, Cape Arago, and Whiskey Run State Parks have long attracted residents and visitors, the establishment of the Bandon Dunes in 1999 accelerated the conversion of low value forests and shrub lands to world-class golf courses. Retirees and second-home residents attracted to the prospect of living adjacent to the golf courses have immigrated to the southern portion of the Coastal Frontal basin, which also has pockets of other rural residential housing (approximately half the land in the sub-basin is owned by out-of-area interests). The Pacific shore has the potential for development of wind and wave energy generation and the associated developments that these activities could induce. Since 1974 land uses in a portion of the South Slough watershed have focused on research and education as part of the South Slough NERR. The South Slough NERR is managed by the Oregon Department of State Lands, as a partnership between Oregon and the National Oceanic and Atmospheric Association (NOAA). The NERR serves local, regional and national communities, both technical and non-technical, by conducting a variety of educational, research, and habitat restoration projects while hosting approximately 25,000 visitors each year. In addition, the Oregon Institute of Marine Biology (OIMB) has been conducting marine research as a University of Oregon field station based in Charleston since 1924. The Coos Watershed Association, formed in 1993 and also based in Charleston, conducts scientific research and habitat restoration projects in partnership with watershed landowners. For such a small area, the Partnership for Coastal Watersheds project area has a plethora of significant issues and controversies associated with it. This State of the Watersheds assessment will provide the Partnership Steering Committee and the community with background data to help evaluate approaches that address the controversies that have arisen around these issues. Mineral Sands Mining: While mining in the Coastal Frontal area has a long history, it has never occurred within the confines of the Coastal Zone Management Act and Oregon’s Statewide Planning Goals. Approximately 1,900 acres are under lease in the Coastal Frontal sub-basin, with about 25 acres actively mined (and another 10 ha. being restored) at any one time. This project has been locally controversial from the start for some residents whose preference is for smaller-scale development and less perceived impact to the environment. In addition to questions regarding compatibility with land use planning and environmental regulations, there are concerns about truck traffic, noise and light pollution, and impacts on groundwater and potable water supplies. However, the mining operation has initially provided significant numbers of jobs at the mining site and at the processing plant in Coos Bay. Industrial Forestry: The most extensive use of land in the Coastal Frontal sub-basin is for the production of timber and wood fiber from privately held woodlots owned by Weyerhaeuser, Inc., Roseburg Forest Products, and Plum Creek Timber Co., Inc., and via timber sales from the Coos County Forest. There are concerns about the sustainability of forest practices in the face of short (35 – 55 year) rotations based on even-aged management and clear-cutting; habitat fragmentation due to harvest patterns and road construction; sedimentation of anadromous fish streams; and financial returns that pale in comparison with converting timberlands for residential and recreational uses. Land Fragmentation: Continuing timber production does have the benefit of maintaining larger ownerships when the alternative is partitioning these properties into 1 to 20 acre “ranchettes” that further increase road and housing densities, demand for services, and add to the difficulty in managing landscapes. While there is a case to be made that these smaller owners may be more highly invested personally in the condition of their properties, they often have vastly different land management objectives that can prove difficult to coordinate. Developed Recreation: It would be hard to argue that the Bandon Dunes represents the highest and best use for the gorse, shrub lands and shore pine covered dunes that existed prior to its creation. These world-class golf courses have increased the visibility and attractiveness of the area to outsiders, provided hundreds of jobs, and helped support local organizations. However, most employees commute from surrounding towns, leading to increased road use, commuting time, and overall housing costs; and the attractiveness has also resulted in an influx of second home purchasers in the vicinity of Bandon Dunes. Energy Production: There is significant potential for non-traditional energy production within the Coastal Frontal sub-basin. Coal-bed methane gas exploration in the Coaledo Formation has occurred in the Coos County Forest adjacent to the sub-basin, although production has not started largely due to the increased supplies from the mountain West states driving prices down. Concerns over methane gas production relate to hydraulic fracturing and its potential effects on potable water wells and groundwater quality, as well as disposal of fresh or saline waters that are a byproduct of the process. Wind energy production has also been explored in the Coastal Frontal sub-basin along the Seven Devils ridgeline, although as of yet no installations have occurred. Concerns related to wind energy are impacts on birds, noise and visual pollution. Finally, there is an exciting potential for wave energy production offshore in the Territorial Sea off the Coastal Frontal sub-basin. While current pilot projects are designated for the area north of the mouth of Coos Bay, there are similar conditions found offshore. While wave energy has significant potential benefits in terms of clean production, manufacturing jobs, and research sites in the area, fishermen and crabbers are concerned about constraints on their activities that might result. There will also be the need for facilities on the shoreline to connect the power produced to the electrical grid. Marine Reserves: There is a proposal to create a marine reserve (MR) and marine protected area (MPA) off Cape Arago to provide, among other functions, a refuge for rockfish. This proposal generated significant local controversy. An advisory group convened by the Oregon International Port of Coos Bay was unable to reach a consensus, but by a two-thirds majority vote recommended that neither a marine reserve nor a marine protected area be established here. There was a consensus statement by the committee identifying the need to further research (biological, social and economic) before a proposal was revisited. Baldwin, E.M., J.D. Beaulieu, L. Ramp, J. Gray, V.C. Newton, and R.S. Mason. 1975. Geology and Mineral Resources of Coos County, Oregon. Bulletin 80. Oregon Department of Geology and Mineral Industries, Portland, OR. Hall, Roberta L. (Ed.) and T.A. Ebert, J.S. Gilden, D.R. Hatch, K.L. Mrakovcich, C.L Smith. 2012. Ecological baselines for Oregon’s coast: a report for agencies that manage Oregon’s coastal habitats for ecological and economic sustainability, and for all who are interested in the welfare of wildlife that inhabit our coast and its estuaries. Oregon State University. Corvallis, Oregon. 79 pp. Madin, I.P., G.W. McInelly, and H.M. Kelsey. 1995. Geologic Map of the Charleston Quadrangle; Coos County; Oregon. Geologic Map Series No. 94. Oregon Department of Geology and Mineral Resources, Salem, OR. Marin Jarrin, J.R., A.L. Shanks, and M.A. Banks. 2009. “Confirmation of the presence and use of sandy beach surf-zones by juvenile Chinook salmon.” Environmental Biology of Fishes 85: 119 – 125.